The Geelong Handweavers and Spinners Guild Inc. entered "The Afternoon Tea Party" , designed by Val Ingeme, into the "Five Articles" Section of the Melbourne Sheep and Woolcraft Show c.1992. To qualify, the entry needed to be from a group of five people and be able to demonstrate a number of wool crafts in at least five different items. "The Afternoon Tea Party" was loaned to the NWM for display and was subsequently donated in 2003. This piece was designed and made by Val Ingeme from wool blend yarn, the plate from wool. Navy blue cloth roll with stitched pockets to hold knitting needles. Roll contains approx 110 different knitting needles or various sizes, make and colour. Some are bamboo/timber, some are plastic or metal. Cloth roll was made by mother-in-law of donor and is designed to fold up to cover the needles prior to rolling. Once rolled, cloth can be secured with two small push buttons. Made by and used by mother-in-law of the donor during her time in Asia and Australia, c1930s. Cardboard folded case that unfolds to reveal 62 bamboo knitting needles stored via elastic ties. There is one labelled fold with knitting needle sizes and several instances of printed text containing English numbers and Japanese characters. When folded up, the item is secured with a push button. 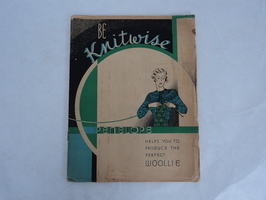 The front cover has a blue sticker which depicts two hands with knitting needles, there is also yellow and white text. Used by the mother-in-law of the donor who spent a lot of their adult life living in Asia prior to WWII. Paper booklet bound with two rusted metal staples on spine. Cover is in colour and depicts a woman knitting. Prominent colours are black, green, blue and cream. Inside covers contains pages which are smaller than the covers. Pages contain printed black text detailing various knitting patterns and knitting information. Back cover has a ruler graphic for measuring. The book was published in the UK. This book was purchased with the help of Mrs E. C. Baker, c/o John Pook and Co, 68 Fenchurch St, London EC3 - from The Needlewoman Shop, Specialists in Needlework, 146 Regent Street London W.1. Then posted to Mrs G R (Joan) Horridge at ICI in Hong Kong. Book was owned and used by Joan Francis Horridge. Silver-coloured metal bell-shaped pin gauge with holes of various sizes, each one with a different number. Reverse is blank. White wool ribbon with yellow stitched text. Ribbon awarded to Mr Charles Wilson Peel of 'Callenondah' at Gnawarre. Mr Peel ran a superfine merino stud. This ribbon is from the Royal Melbourne Show 1969. Yellow/gold wool ribbon with red stamped text. Ribbon awarded to Mr Charles Wilson Peel of 'Callenondah' at Gnawarre. Mr Peel ran a superfine merino stud. This ribbon is from the Geelong Legacy Fleece Show 1973. Navy blue wool ribbon with stamped yellow text. Ribbon awarded to Mr Charles Wilson Peel of 'Callenondah' at Gnawarre. Mr Peel ran a superfine merino stud. This ribbon is from the Geelong Legacy Fleece Show 1969. Dark red wool ribbon with yellow stamped text. Ribbon awarded to Mr Charles Wilson Peel of 'Callenondah' at Gnawarre. Mr Peel ran a superfine merino stud. This ribbon is from the Geelong Agricultural & Pastoral Society 1973 Show. Yellow wool ribbon with red stamped text. Red rosette-type ribbon with yellow text and yellow and gold metal badge inside rosette. Badge had an embossed rams head with text encircling at the edge. Two short red ribbons with yellow text attached at the badge. Ribbon awarded to Mr Charles Wilson Peel of 'Callenondah' at Gnawarre. Mr Peel ran a superfine merino stud. This ribbon is from the National Fleece Competition 1960 and was awarded for Second Prize. Navy blue wool ribbon with stamped yellow text. Yellow tassels at each short end. Ribbon awarded to Mr Charles Wilson Peel of 'Callenondah' at Gnawarre. Mr Peel ran a superfine merino stud. This ribbon is from the Geelong Legacy Fleece Show 1962 and was awarded as a Trophy Winner. Red, white and blue wool ribbon with yellow tassels on short ends. Yellow stitched/stamped text. Text is divided across the three coloured panels which are stitched together with white thread. Ribbon awarded to Mr Charles Wilson Peel of 'Callenondah' at Gnawarre. Mr Peel ran a superfine merino stud. This ribbon is from the Geelong Agricultural & Pastoral Society 1959 Show and was awarded Champion for Sample of Merino Lambs Wool. Ribbon awarded to Mr Charles Wilson Peel of 'Callenondah' at Gnawarre. Mr Peel ran a superfine merino stud. This ribbon is from the Geelong Agricultural & Pastoral Society 1961 Show and was awarded Champion Fleece of Show. Red, white and blue wool ribbon with yellow tassels on short ends. Yellow stitched/stamped text. Text divided across the three coloured panels which are stitched together with white thread. Ribbon awarded to Mr Charles Wilson Peel of 'Callenondah' at Gnawarre. Mr Peel ran a superfine merino stud. This ribbon is from the Geelong Agricultural & Pastoral Show in 1977 and was awarded Most Attractive Merino Fleece. Red, white and blue wool ribbon with yellow tassels on short ends. Yellow stitched/stamped text. Text divided over the three coloured panels which are stitched together with a white thread. Ribbon awarded to Mr Charles Wilson Peel of 'Callenondah' at Gnawarre. Mr Peel ran a superfine merino stud. This ribbon is from the Geelong Agricultural & Pastoral Society Show in 1960 and was awarded Champion for Sample of Merino Lambs Wool. Red, white and blue wool ribbon with yellow tassels on short ends. Yellow stitched/stamped text. Text divided into three lines, one on each coloured panel. Colour panels stitched together with white stitching. Ribbon awarded to Mr Charles Wilson Peel of 'Callenondah' at Gnawarre. Mr Peel ran a superfine merino stud. This ribbon is from the Geelong Agricultural & Pastoral Show in 1959 and was awarded for being the Champion Merino Wool Fleece. Cream coloured stiff paper certificate with dull gold/green borders, black text and grey typed personalised text to C.W. Peel for Merino lambs wool. Heading at top of certificate. Certificate awarded to Mr. Charles Wilson Peel from the Royal Agricultural Society of Victoria, 1969. The certificate is for Third Prize. Mr Peel owned a superfine merino stud at Gnawarre named Callenondah. Cream coloured stiff paper certificate with navy blue printed text and sketches. Black ink handwritten personalised text to C.W. Peel at Gnawarre. Heading at top of certificate above two symbolic rams. This is for Class K, Section 1. Certificate awarded to Mr. Charles Wilson Peel from the Geelong Legacy Fleece Show, 1973. The certificate is for Third Prize. Mr Peel owned a superfine merino stud at Gnawarre named Callenondah. Cream coloured stiff paper certificate with navy blue printed text and sketches. Black ink handwritten personalised text to C.W. Peel at Gnawarre. Heading at top of certificate above two symbolic rams. This is for Class M, Section 1. Certificate awarded to Mr. Charles Wilson Peel from the Geelong Legacy Fleece Show, 1969.. The certificate is for Third Prize. Mr Peel owned a superfine merino stud at Gnawarre named Callenondah. Cream coloured stiff paper certificate with navy blue printed text and sketches. Black ink handwritten personalised text to C.W. Peel at Gnawarre. Heading at top of certificate above two symbolic rams. This certificate is for Class N, Section 1. Certificate awarded to Mr. Charles Wilson Peel from the Geelong Legacy Fleece Show, 1969. The certificate is for Third Prize. Mr Peel owned a superfine merino stud at Gnawarre named Callenondah.